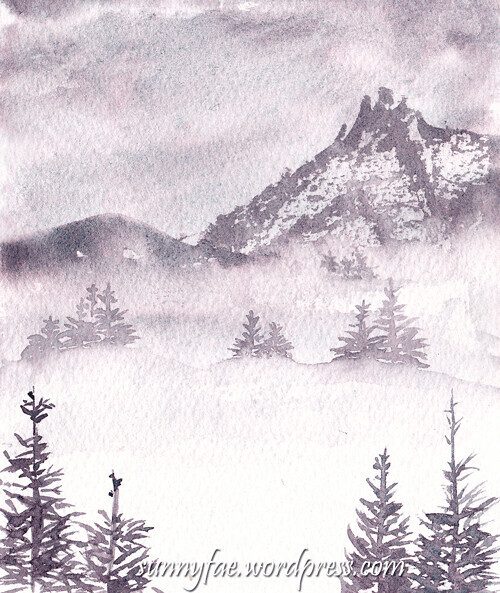 I have been seeing watercolour paintings of little fir trees fading into the mists everywhere lately. It looked like fun so I thought I would have a go myself. 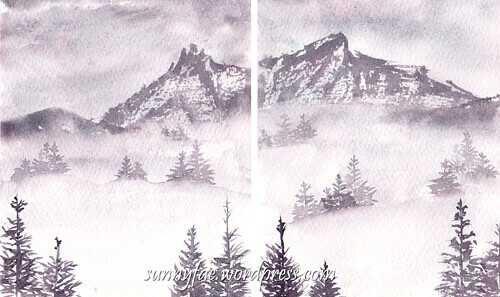 Since it’s been cold and snowy here I decided to paint snowy mountain landscapes. I’m using 100% cotton watercolour paper 190 gsm (90 lb). I had bought this paper because I wanted to make it into a small sketchbook. I generally paint tiny watercolours and this would give me a chance to get used to using a better quality of paper without any pressure. The paper did buckle a little but not so much as to affect this painting. I used only one colour (moonglow, Daniel Smith) varying the amount of water to change the tone, it is a very granulating colour that splits into shades of blue and purple. The sky was a quick wet in wet wash and left to dry; the mountains were so easy, I used a no. 4 rigger, scraped the brush on its side and with just a few passes the brush did all the work with no fiddling to make all the rock faces and crags. Amazing! I used more colour and less water to make the trees appear nearer. This looks like one picture cut in half but they were side by side on a board and the as thee brush skipped from one painting to another it gives an impression of one whole painting. I’ve tried painting misty landscapes before and found it quite difficult but I like how these turned out and I have decided moonglow is my new favourite colour. I have not made the sketch book yet, something else for the “to do” list. Love the sketch and the colour. What brand is it? I wish you a wonderful Christmas and a bright and beautiful New Year. These are simply lovely, and wonderful. Well done.